With the Lenovo Miix 320, you have the best of both worlds. A fully functional laptop and a tablet-in one streamlined, portable device. The Miix 320 is an interactive, multimedia-rich tablet, the next it's a full-fledged laptop. Productivity by attaching the island-key keyboard to the 10.1" FHD tablet. 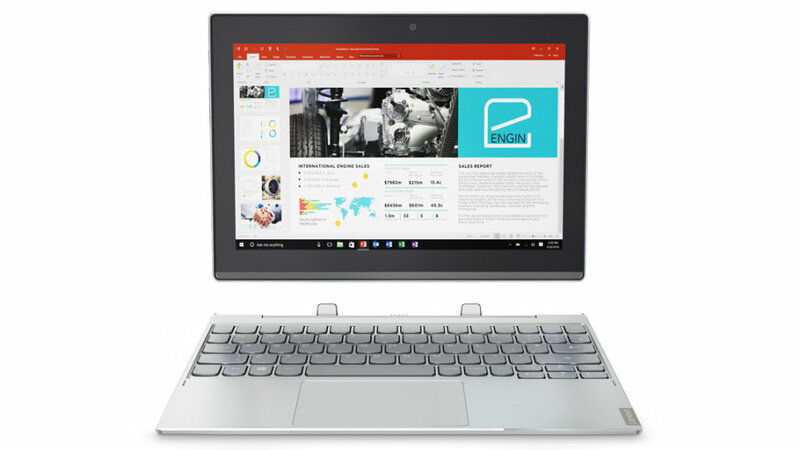 The keyboard gives you two ports for your other devices and a precision touchpad that lets you utilize pinch-to-zoom and multi-finger gestures. Streamlined design, clean lines, and tasteful accents, the Miix 320 is super light-just around 1 kg. It gives you 10 hours of battery life with a single charge. The optional LTE gives you the flexibility to get online anywhere there's mobile data. Stunning FHD display lights-up everything in rich, vibrant detail. With Dolby Advanced Audio, the Miix 320 delivers crisp, clear audio through its speakers or headphones.